This elephant mug has a little space for a teabag behind his ears which I thought was so cute, and also very handy for those who favour a fruit tea that needs a little more time to brew… no more standing around in the kitchen waiting to take out the bag, just pop it in the little pouch! Not a mug fan? How about a beautiful Royal Albert teacup & saucer instead? This one is just so pretty and would make a lovely gift. Sometimes it’s nice to make a pot of tea, and this glass teapot is brilliant because you can see your tea brewing which means no more pouring a cup to find it needs another minute or so. Whittard’s afternoon tea collection is the gift for those who want to try some different flavours of tea. 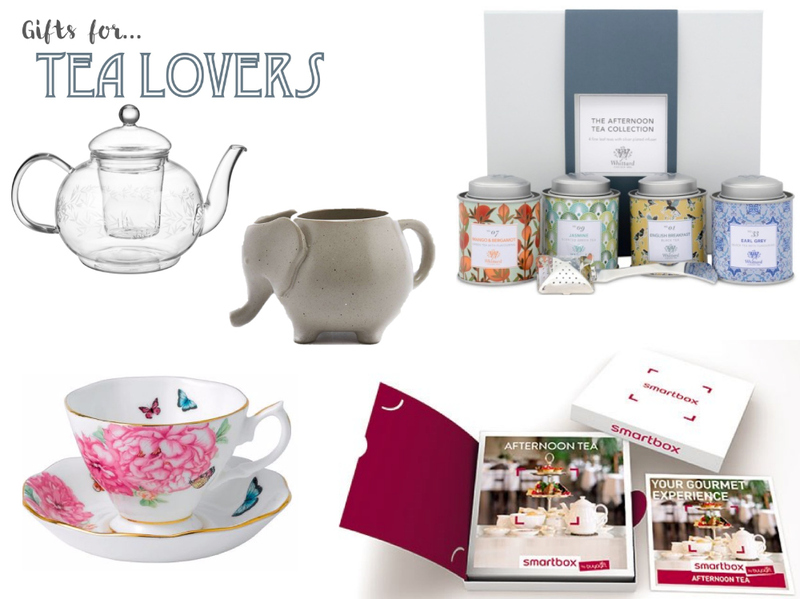 It comes with four little caddies of loose tea and a silver plated tea strainer. Finally, an afternoon tea for two voucher is the perfect gift for a couple who love tea and cake. I’ve chosen this one as you can choose from a number of locations across the UK, and you can also upgrade to include a glass of champagne for an extra special treat.